Also this year you will find us at the Jet Power Event in Donauwörth-Genderkingen – Germany, 14.-16. September. It’s going to be a great opportunity to meet us again, see our new H16BL2 engine and also buy it with a great discount of 10%. 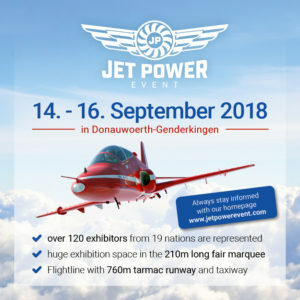 Number of engines for Jet Power Event will be limited so do not miss this opportunity! Looking forward to meet you there, yours Hybl Turbines Team.